Taxi mogul, Robert Scull, for instance, became notorious in the art world for assembling a collection of Pop and Abstract Expressionist art to then re-sell the artworks at exponentially higher prices than what he had originally paid the artists. Scull purchased a painting by Robert Rauschenberg for US$900 only to sell it at auction for US$85,000, a move that outraged Rauschenberg and others. At the same time, the Scull Sale at Sotheby’s New York in 1973 jump-started the money-driven market we recognize today, where art as commodity has taken over art as art. Robert Hughes compared Leonardo da Vinci’s Mona Lisa to the way in which commerce has changed the art world’s relationship to art. In 1962, the Mona Lisa arrived at the Metropolitan Museum of Art on loan from the Louvre. Upon arrival, John F. Kennedy and Jackie Kennedy greeted the painting, treating it like a celebrity with press photographers and film teams to insure the global broadcasting of this event. The widespread imagery of the Kennedys meeting the Mona Lisa bolstered their status as patrons of art. In just three and a half weeks, over one million people clamored to see the legendary painting. However, Hughes asserts that most people did not come to see the Mona Lisa. Instead, they came in order to say they have seen it. “It is now treated like a photo in a magazine, quickly scanned then discarded,” says Hughes. “The painting left the Louvre but the meaning stayed behind.” The ubiquity of this sixteenth-century painting has only grown, yet its significance has been exhausted, exaggerated or overlooked completely. This phenomenon, the cult of the celebrity masterpiece, becomes the pitfall of contemporary Chinese art. In the early 1990s, Chinese experimental artists looked to the art market as an alternative outlet to showcase their art. In this new space, Chinese artists and curators had to reassess their strategies to gain exposure and recognition. Released in 1991 and organized by critic and curator, Lü Peng, Yishu Shichang magazine published a wealth of information about international art practices. The information ranged from a New York gallery guide and translations of articles from international art magazines to detailed information about U.S. legal issues involving art transactions. The information made available by Yishu Shichang fueled the Chinese art world’s growing interest in the international market. Organized in 1992 by the editorial board of Yishu Shichang under the direction of Lü Peng, the Guangzhou Biennial Art Fair was the first significant attempt to establish a domestic market. The combination of accelerating economic reforms in China and the spectacular rise in prices for artworks by modern western artists prompted the biennial’s organizers to unabashedly promote it as a profit-making venture. None of the 27 award-winning artists at the biennial came to symbolize both the premise and potential of an art market more so than Wang Guangyi, who was one of the biennial’s two first-prize winners. Wang exhibited several oil paintings including Marlboro from his new Great Criticism series (fig 2). 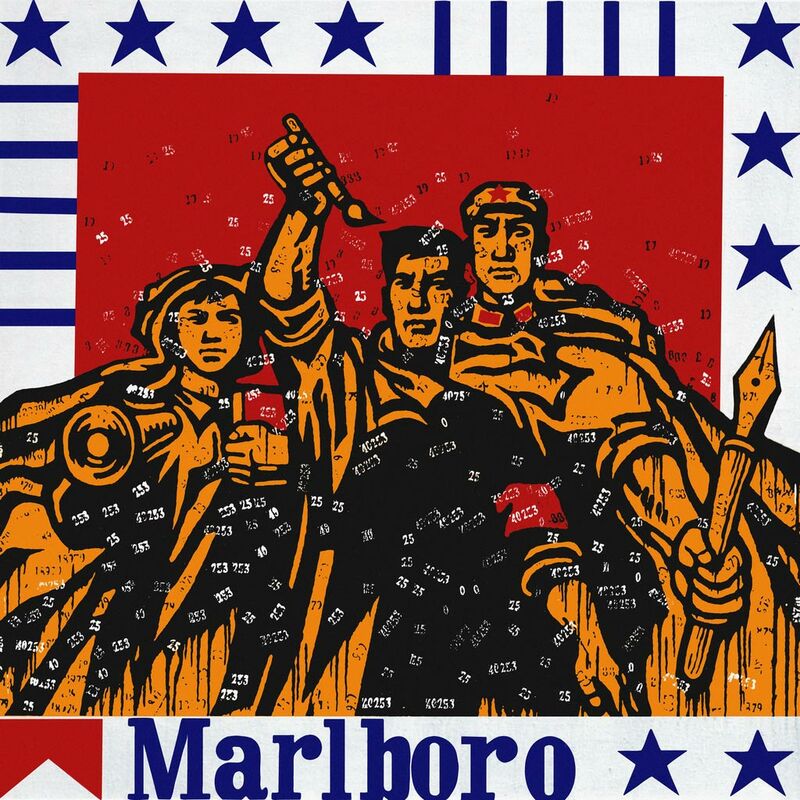 Marlboro depicts a Cultural Revolution-era composition featuring a factory worker, peasant, and a People’s Liberation Army Soldier, outlined in black and filled in with yellow pigment. A blue and white border decorated in stars and stripes in addition to an approximated logo for Marlboro cigarettes frames the figures. 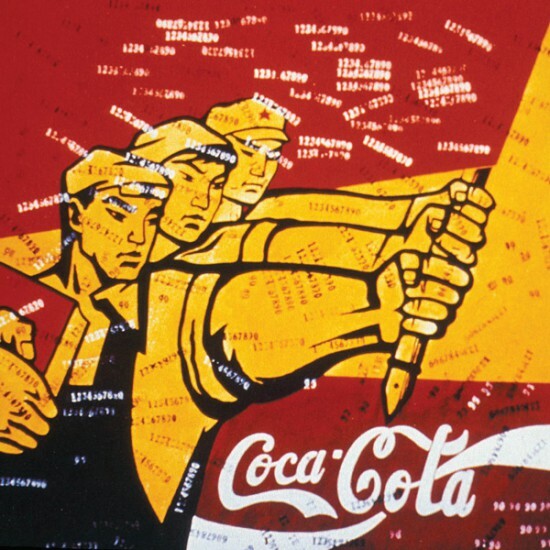 Not exactly a direct copy of typical Communist propaganda imagery, Wang replaces the hammer, sickle, guns and grenades with paintbrushes and pens. In doing so, he trades the implements of the Cultural Revolution for the tools of creative enterprise. At first, the early paintings from Wang’s Great Criticism series (fig 2, 3) received positive reactions from Chinese critics and viewers for its novelty. These paintings combine motley selection of symbols from diverging political, intellectual, and commercial spheres. However, the collision of Chinese and Western ideologies appears more humorous than distressing. It is unclear whether Wang was celebrating the ascendance of the intellectual class or the arrival of global capitalism. On the other hand, the juxtaposition of Cultural Revolution propaganda and consumer advertising could also draw a parallel between the slogans of today and the empty promises of the past. In highlighting the replicative quality of the mass-produced image, Wang reveals the power of print media to both increase a subject’s visibility and simultaneously diminish its impact. The ambiguity of these early paintings from the Great Criticism series fascinated the jurors of the biennial. Yang Xiaoyan praised Wang for combining icons rooted in different temporal and cultural contexts to create a new set of symbols signifying contemporary culture. Nevertheless, Karen Smith explained that Wang had no time for “the romance of the penniless artist” and instead focused on the earnest pursuit of sales prospects. Wang Guangyi’s bold quest for a commercially successful art product stimulated reactions in China that have vacillated between disapproval and respect. In an article in Yishu Shichang, Wang openly discussed how money could bolster the “mythical image” of an artist, which in turn would augment the value of his artwork.Wang was essentially declaring that by submitting to the logic of the art market, artists could become celebrities and increase demand for their artwork. He understood that brand recognition would assure his critical and commercial success and thereby focused his efforts on replicating paintings from his award-winning Great Criticism series, with only minor variations. Although some critics were intrigued by Wang’s approach, others were less sympathetic and accused both Lü Peng and Wang Guangyi for falling into a commercial trap. In defense of the market’s role during this period, the creation of a market was not just a means to improve the standard of living for artists; high prices for artworks were also a way to legitimize less conservative Chinese art in the eyes of state authorities. Especially in the wake of Deng Xiaoping’s economic reforms, artworks that generated financial returns seemed valuable and exceptional to conservative taste in the eyes of officials. Michael Findlay explains that art, like currency, has no intrinsic or objective value and does not sustain basic human needs such as shelter, food, clothing and transport. Yet art is constantly being stripped of everything but its value. Furthermore, value is assigned and sustained by the stipulation and collective intentionality of a small group of people. And as a result of the increasing association between artworks and their commercial value, experimental artists and curators have benefitted from the lucrative potential of art as a means of gaining state support. Nonetheless, these artists and curators continued to receive regular, official reminders that their work went against the grain. As soon as Deng Xiaoping ended China’s isolation period in 1993, contemporary Chinese art began to move offshores and eventually made those outside of China more informed about this body of art than those inside China. More than seven major international exhibitions staged in large-scale survey museums took place that year. Contemporary art made in China was in high demand by international consumers who were especially curious to see what had become of Chinese art since Tiananmen Square. Although the Guangzhou Biennial Art Fair was a pioneering attempt to develop a domestic market for experimental art, this attempt was premature considering the lack of a large and wealthy enough consumer base. Among other artists in his generation, Wang was eager to take advantage of growing international demand. He and other artists started looking for potential buyers in overseas markets and found considerable success.